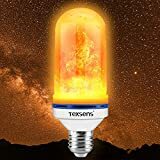 LED bulbs are a dime a dozen, but you’ve never seen a bulb quite like the Texsens LED Flame Effect Light Bulb. These awesome bulbs fit just about anywhere a normal LED light bulb fits, but they don’t simply cast light. Instead, they’re designed to look like real flickering flames — and they really do! These bulbs are awesome and they’re discounted right now on Amazon. Clip the 7% on-site coupon and you’ll enjoy Amazon’s lowest price ever! Texsens flame lamp simulates natural flame, flickering flame light bulbs, no open flame, safe and energy-saving LED light source. Atmosphere lighting, holiday gifts and family holidays, gatherings, this decorative light bulb is essential for every household. Decorative bulb, warm flame colors decorate your space and give you a quiet, romantic and relaxing moment.